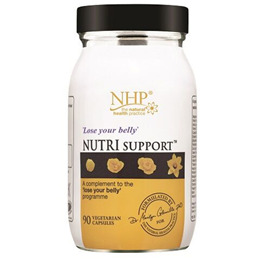 Natural Health Practice - Nutri Support is a special multivitamin and mineral formula that contains all the most important nutrients that help to reduce fat from around your waist. Nutri Support contains chromium which contributes to the maintenance of normal blood glucose levels. It also contains magnesium which contribute to the reduction of tiredness and fatigue and promotes normal energy-yielding metabolism. Nutri Support also contains the B vitamins (B1, B2, B3, B5 and B6) which contribute to the reduction of tiredness and fatigue and other beneficial nutrients including vitamin E, alpha lipoic acid, manganese, zinc and co-enzyme Q10. It also contains botanicals including green tea and Siberian ginseng. Nutri Support is free from gluten, yeast and dairy products. It is made without the use of artificial flavours, colours or preservatives, it is Kosher and approved by the Vegetarian Society. Vitamin E (as natural D-Alpha Tocopheryl succinate), Alpha Lipoic Acid, Vitamin C (as calcium ascorbate), Siberian Ginseng powder (Eleutherocus senticosus root), Vitamin C (as magnesium ascorbate), Green Tea PE 4:1 (Camellia sinensis leaf), Pantothenic Acid (as calcium pantothenate,Vitamin B5), Magnesium (as citrate), Coenzyme Q10, Niacin (as nicotinamide, Vitamin B3), Riboflavin (as Vitamin B2), Thiamine (as HCl, Vitamin B1), Vitamin B6 (as Pyridoxal-5-Phosphate), Zinc (as citrate), Manganese (as citrate), Chromium (as Picolinate), Folacin (Folic Acid), Biotin, Vitamin B12 (as Hydroxycobalamin), Capsule Shell: Hydroxypropyl Methylcellulose. Below are reviews of Natural Health Practice Nutri Support - 90 Capsules by bodykind customers. If you have tried this product we'd love to hear what you think so please leave a review.